In July 2015 and 2016, an unusual disease was observed on scapes of approximately 10% of field-grown elephant garlic (Allium ampeloprasum var. ampeloprasum) growing in a field in Newark, New York. Symptoms were sunken lesions up to 50 mm long, causing twisting, girdling and collapse of the scape. Lesions were initially cream to tan-coloured and became orange with the production of numerous acervuli without setae. Symptoms were confined to the scape. Although scapes are often removed to improve bulb yield, the disease is of importance where scapes are intended for fresh market sale, or where bulbil production is required for propagation. Conidia from acervuli in lesions were spread over 2% water agar, incubated at 20°C for three days, and hyphal tips transferred to potato dextrose agar (PDA). Conidia (n = 200) of isolate BD001 cultured on 10% PDA were narrowly elliptical, (11.7-) 14.5 (-17.4) µm long × (3.0-) 3.8 (-4.8) µm wide, and pointed at both ends, similar to Colletotrichum fioriniae (Shivas & Tan, 2009; Damm et al., 2012). Standard primers were used to amplify the internal transcribed spacer (ITS), actin (ACT), glyceraldehyde-3-phosphate dehydrogenase (GAPDH) and β-tubulin (TUB2) regions. Sequences were deposited in GenBank for two isolates, BD001 (KY886306-KY886309) and BD004 (KY886310-KY886313). Identity to ex-holotype CBS 128517 in the ITS (NR_111747), ACT (JQ949613), GAPDH (JQ948622) and TUB2 (JQ949943) regions for BD001 was 100%, 100%, 98.4% and 98.6%, respectively, and for BD004 was 100%, 98.8%, 98.0% and 99.8% respectively. Isolates BD001 and BD004 were deposited in the International Collection of Microorganisms from Plants, Landcare Research, New Zealand as ICMP 21632 and 21633, respectively. For pathogenicity testing, isolate BD001 was grown on 10% PDA (20°C for 30 days) to produce conidia. A scalpel blade was passed through a conidial mass prior to making an incision (approximately 2 mm long by 0.5 mm deep) in a surface-sterilised scape. For each of three trials, four scapes were inoculated at five positions. For controls, scapes were wounded with a sterilised blade. Scapes were incubated under high humidity at 20°C. At seven days, disease was observed on four, four and seven of the twenty inoculation sites in each trial respectively, but not on control scapes. Symptoms were sunken cream-coloured lesions (4-11 mm long by 3-5 mm wide), upon which developed orange-coloured sporulating acervuli without setae. 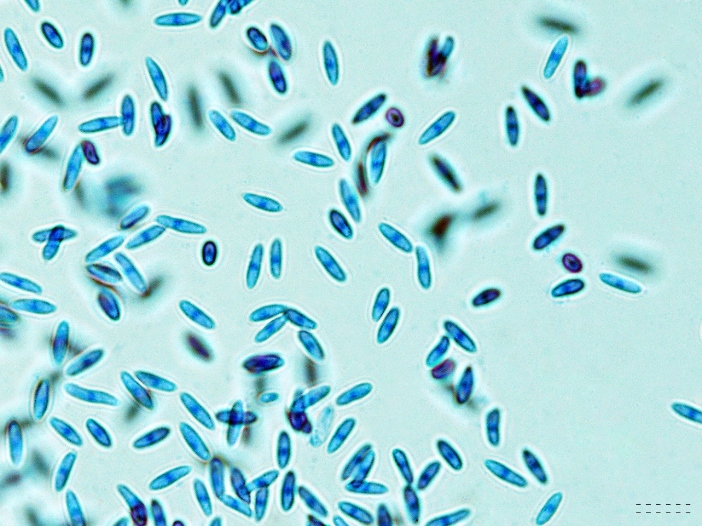 Conidia were of similar size and shape to C. fioriniae, and conidia transferred to PDA resulted in colonies similar to C. fioriniae. This is the first report of C. fioriniae causing disease of Allium. Since this study, anthracnose has been observed on A. sativum scapes on several farms across New York, USA. 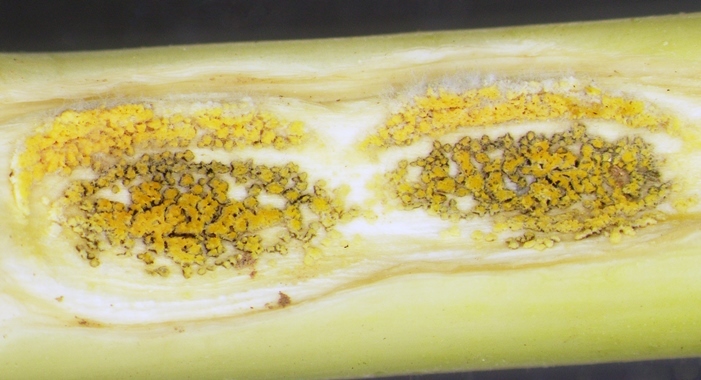 Figure 1: Symptoms of anthracnose (twisting and girdling) on an elephant garlic scape collected from the field. Bar = 1 cm. 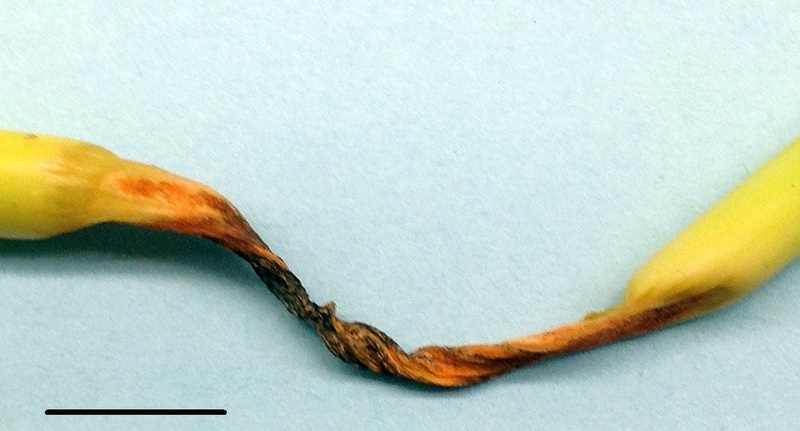 Figure 2: Sporulating acervuli of Colletotrichum fioriniae on scape. Figure 3: Conidia of Colletotrichum fioriniae from acervuli. Bar = 20 µm. We thank Ms Ammie Chickering and Mr David Stern for assistance in collecting diseased material. Shivas RG, Tan YP, 2009. A taxonomic re-assessment of Colletotrichum acutatum in Australia, introducing C. fioriniae comb. et stat. nov.and C. simmondsii sp. nov. Fungal Diversity 39, 111-122.